In the April 19, 2010 issue of 'The New Yorker' you will find the above page. 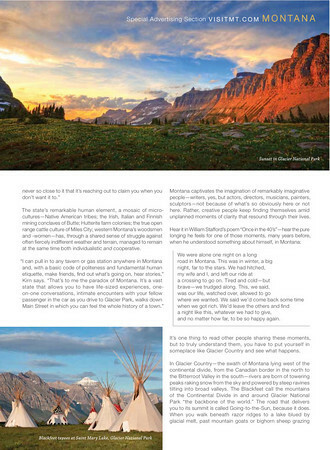 Montana Office of Tourism took out a 4 page Advertorial in the magazine and used the same image of mine that is plastered in and on busses and trains around the country. Not a huge deal; but something fun that I thought I would share. I captured the image in Glacier National Park from above Logan pass on July 4th, 2009 at sunset. You can see the image and others from the trip here. The image is a High Dynamic Range Merge.